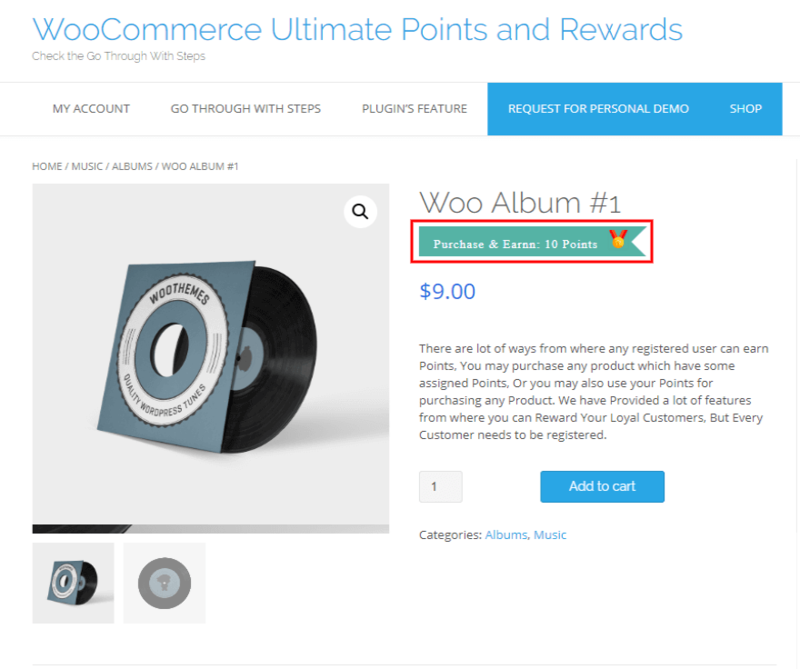 Woocommerce Ultimate Points and Rewards plugin helps to increase conversions, generating leads and filtering your potential customers from the crowd by allowing the “Loyalty” program into their store. The plugin allows admin to give the points of your customers on each action performing on the site and redeem those points into the discount. 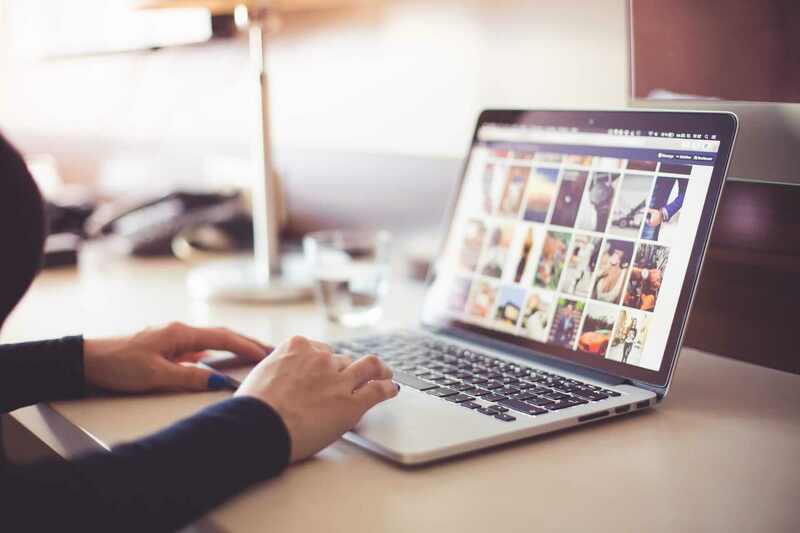 The administrator can provide the points to their customer at the signing in on your website, Referral User, Share the Referral link, Referral Purchase, Product Assign, Per Product Purchasing, Per Currency Spend and Reviewing the products. Redeem those points into the Coupons, From the Cart Sub Total or Directly purchasing the products. Set the expiration date of the coupons or set how many times a customer can use that particular coupon. Set the expiry date of Points. On selected date points will get expired. Create different Membership level to the customer and provide discount according to their membership level. Deduct the customer’s points if they make a refund request. Send the Notification Mail as a reminder of the expiration of points. The administrator can also allow to their customer to share earned points with someone. 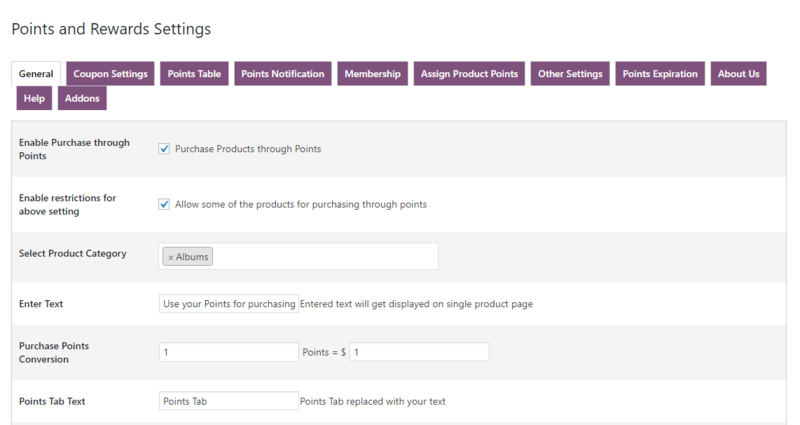 “Points” tab is a section that holds all the points of the customer which is display on the “My Account” page. It will be visible to only for the registered customers, not to Admin. 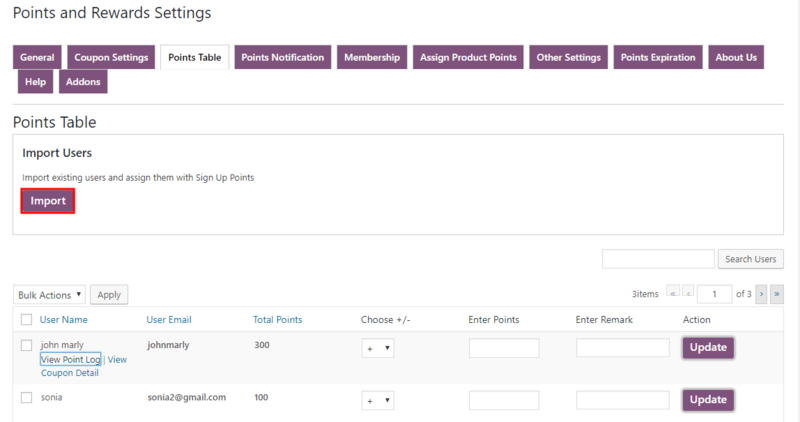 If the admin wants to see the “points” tab, register as a customer and please make sure to save Permalink once. For saving the permalink first Login to your admin panel and go to WordPress “Settings > Permalinks” and click on “Save Changes” button. After Clicking on this button your permalinks will get saved successfully. 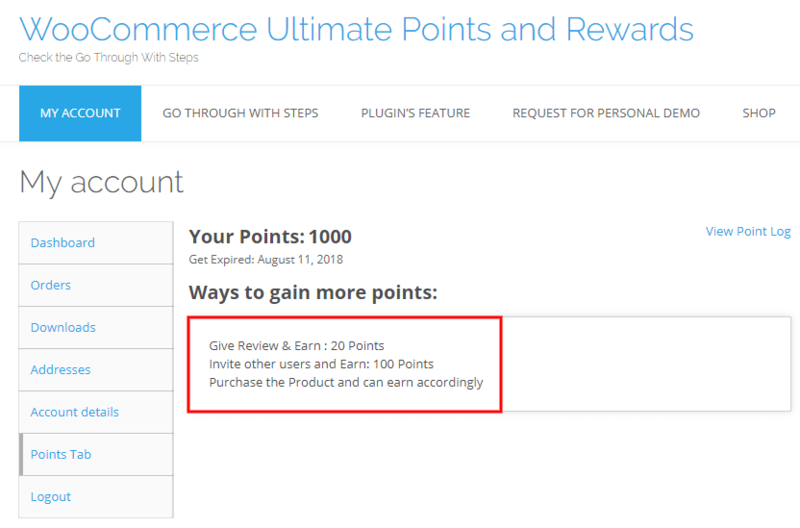 In this section, Firstly you will enable the plugin and set how many points customer will earn on which action. Enable the Signup Points for your customers. When customers sign up on your site then they will get some signup points as the reward. 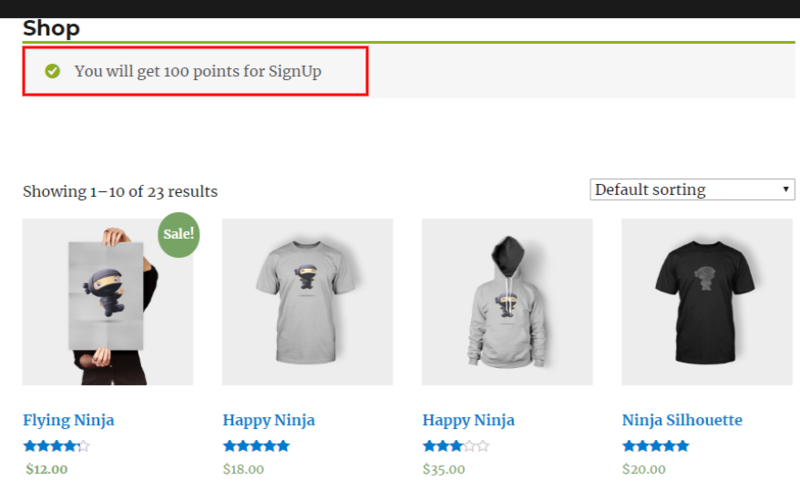 For example, we set the 100 points as the signup rewards, when the customer registers in site then they earn 100 points.  Note: Please make sure you have enabled the required setting, as well as your Registration Form, must be of WooCommerce Registration. For any third party registration form, we need to check the possibility of making the compatibility. After enabling Comments Points, your customers will get the review points when they comment on products or posts. Here we set the 20 points as the comment reward. If the customer comment on your site then they will get 100 points. After enabling this setting your customers earn points by inviting other users on the site by the referral link. Here you can also add the required limit for the referral, after completing this limit your customers will get the points. Minimum Referrals Required: Here you can enter the minimum required limit for the referrals, your customer will able to get a reward after completing the condition. Here you can see, Minimum 5 invites are required to get a reward of 100 points. Enable the Referral Purchase Points for the customers. Through this setting a customer can get the points on the referee(user invited by the customer) purchase, you can also apply the restriction on the referral purchase points. Referral Purchase limit: After enabling this setting, the referee(user invited by the customer) would get assigned points after till limit would be reached. 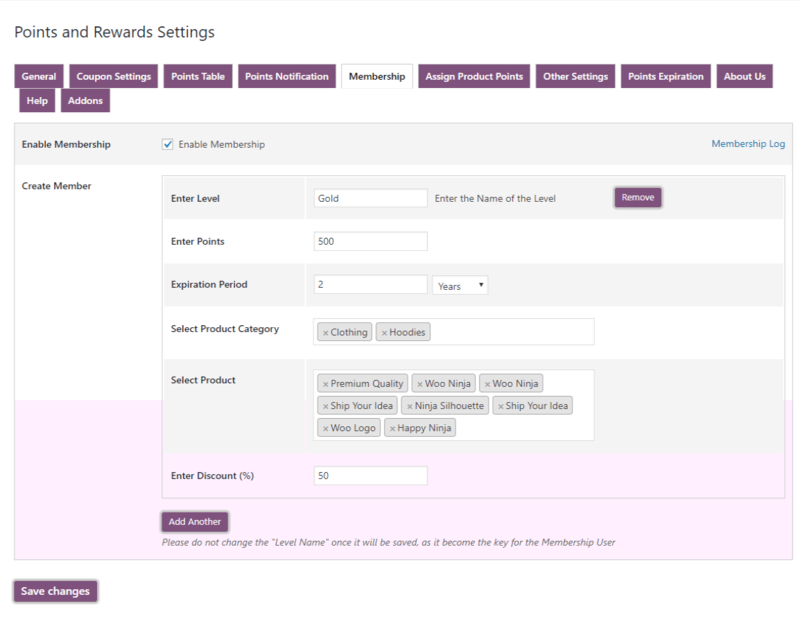 Enable this setting when you can allow the customer to get the points only for the referral purchase, not referral points that means when the invited user(referee) purchased the product then only the customer gets points. Enable social media channel for sharing the referral links. After enabling this setting customer can share a referral link on selected channels of social media. 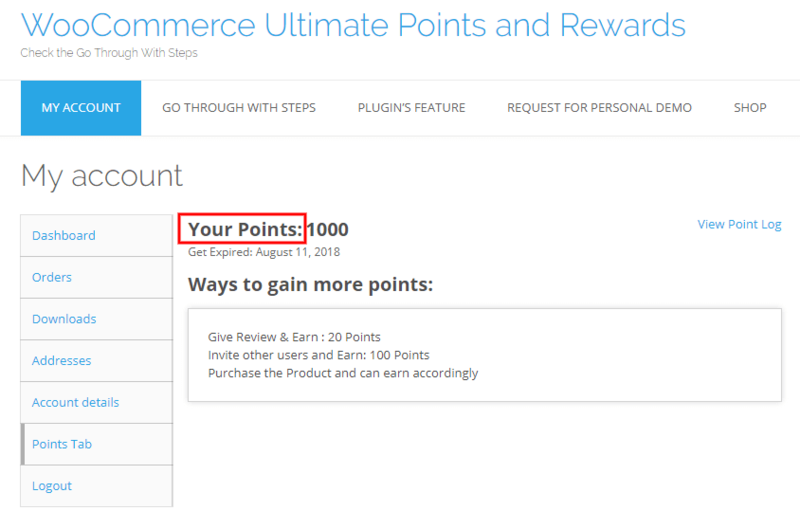 This text display on the points page with the total number of points. Here you can see the text append before the total number of points. You can paste these shortcodes on the My Account Page to guide your customers to gain more points in various ways. 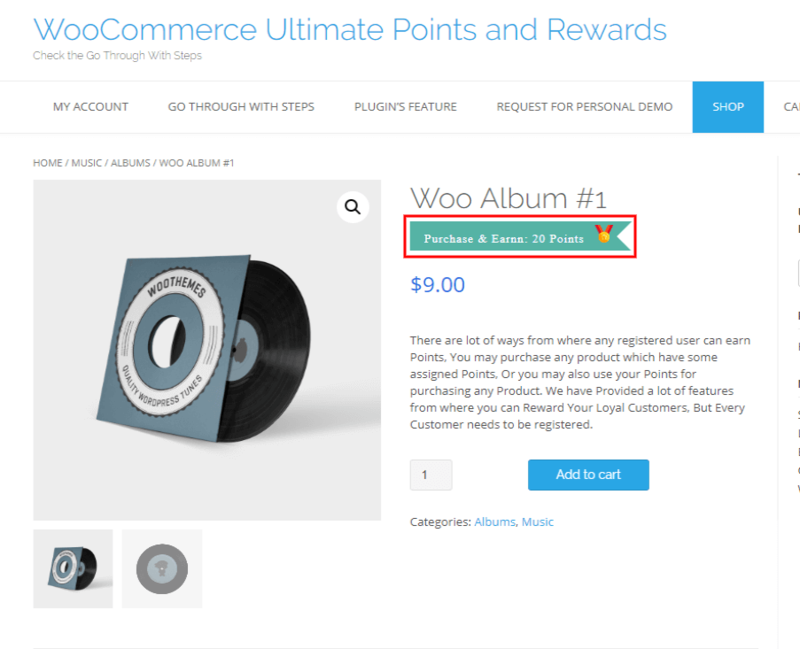 Here display the various ways to earn more points on the front end. 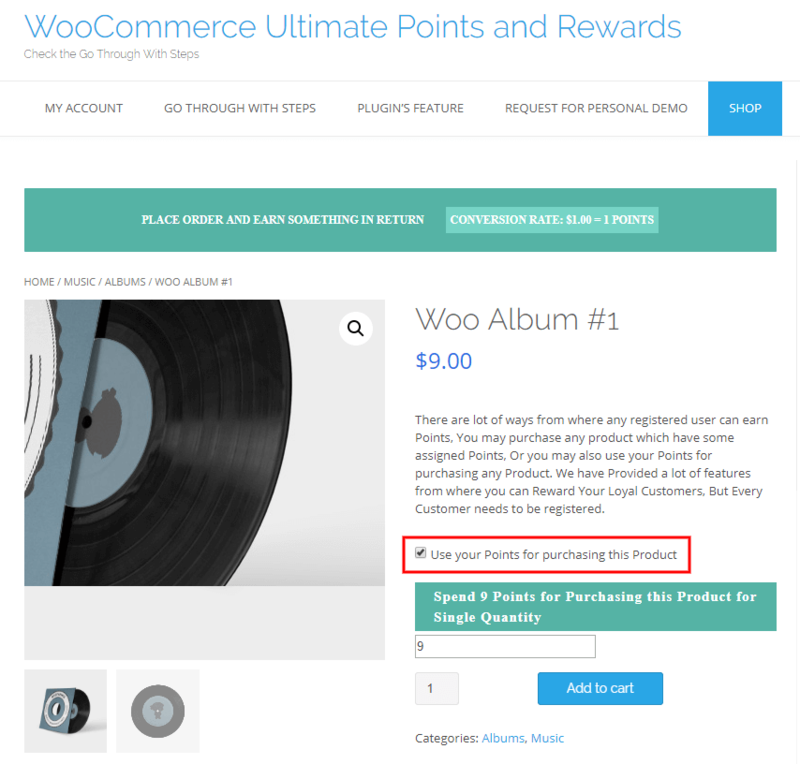 This setting allows/restrict your customers to purchase products through points. 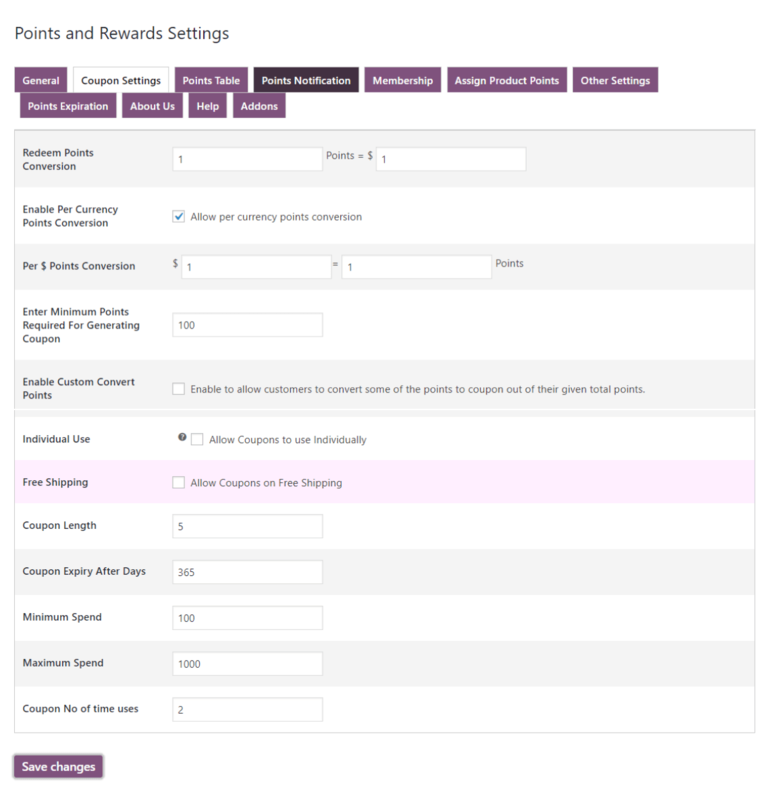 Enable Purchase through points: After enabling the “Purchase through points” setting your customer will able to purchase the product through the earned points. Purchase Point Conversion: Through this setting, you can set the money for the valuable points. for example, here we can show that 1 point is carried as $1. Enable Restriction for Purchase through points: For this setting, you can restrict the particular categories for the purchasing through the points. Here you can also apply the restriction through per product wise. 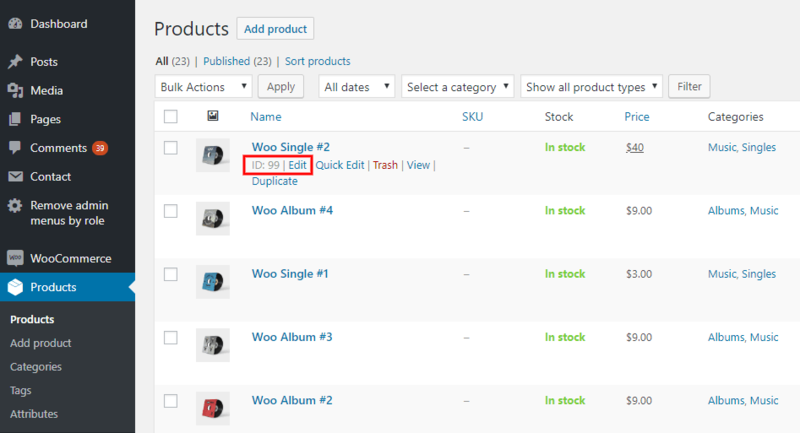 Go to the product-> edit page of the particular product. scroll down and go to the “Points and Reward section”. Enable the setting to apply the condition for that particular product doesn’t purchase through the points. Enter Text: Enter the text which you want to display the message on the single page of the product for notifying the user to use the points during purchasing the product. Through this setting, you can replace the Point tab text with your text. In this section, you can allow your customer to generate the coupon with the multiple terms of conditions like how much points equivalent to the money, Enable Per currency point conversion, Minimum Points limit for generating coupon, Set the expiration date of the coupon, Minimum Points limit for generating the coupon, Maximum and minimum spend of coupon, how many time a coupon valid for use etc. Here you can set how many points will be equivalent to the money. 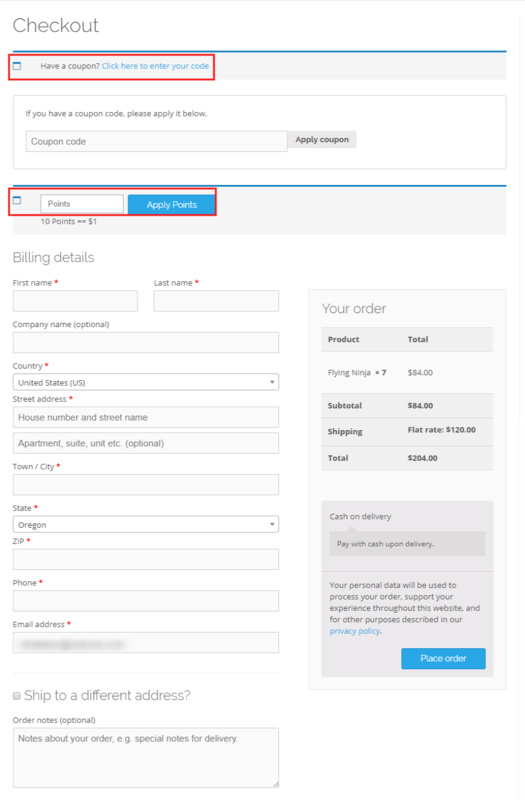 After enabling the setting your customer can generate the coupon by clicking on the “Generate Coupon” button. Here you can allow the customer per dollar spent points, that means the customer will get the points on per dollar spends on the site. Your customer can see the notification on the shop page. Here you can set a minimum points limit for coupon generating after that limit your customer can convert their points into the coupon. Through this setting, you can allow the customers to convert their points into the coupon according to their necessity. After entering the points and click on the “Generate Coupon” customer can generate the custom coupon. 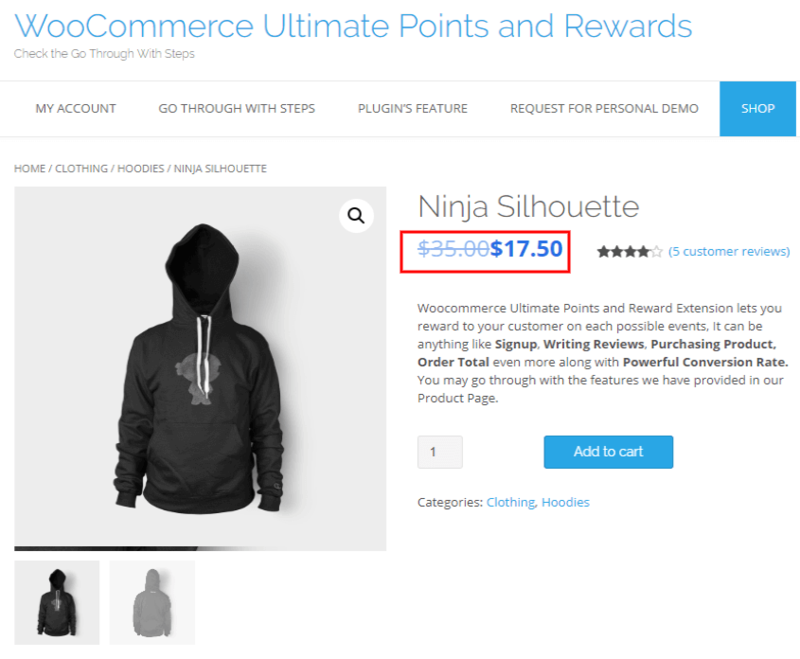 WooCommerce Ultimate Points and Rewards allow you to enable the setting of individual use of a coupon. After enabling this setting your customer cannot be used a coupon with the combination of other Coupons. Check this box if the coupon grants free shipping. A free shipping method must be enabled in your shipping zone and be set to require “a valid free shipping coupon”. You can enter the coupon length excluding the prefix. The Minimum length of the coupon is 5. 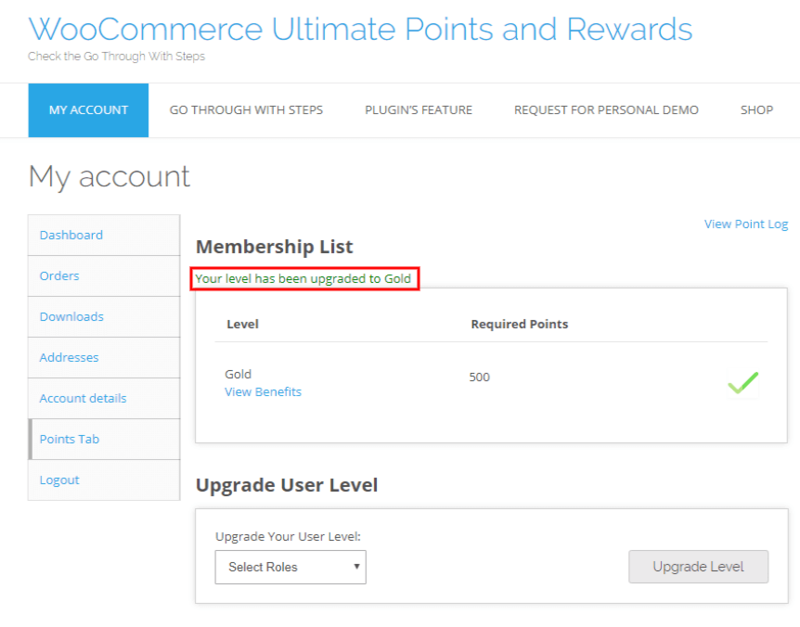 WooCommerce Ultimate Points and Rewards allow you to enter a number of days after which Coupon will get expired. Keep value “1” for one-day expiry when the order is completed. Keep value “0” with no expiry. From this setting, you can restrict a customer for coupon use by the maximum and minimum limit of spending. If you enter minimum spend limit is 500 and maximum spend limit is 5000 then your customer use coupon under 500 to 5000 spending. 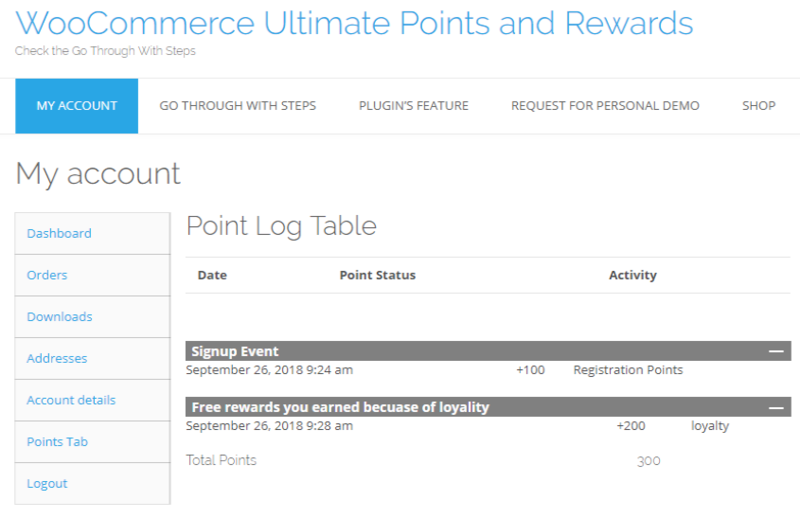 WooCommerce Ultimate Points and Rewards Plugin allow you to set how many time a coupon valid for use. for example, if you enter 2 then customer use a coupon only two times. Goto, the “Others Setting” tab -> Scroll down to the “Disable Points Conversion” setting. From here you can disable the coupon formation functionality for the customers. Through this setting, the plugin allows you to view the point log, coupon detail and modify the points of the customer with the specific remark. for example, if you want to add some points of a customer simply enter the necessary points, a reason for that and click on the update button. Similarly, you can also deduct the point of the customer. On the Account page, your customer can view their point logs. If you want to see point log of any customer click on “viewpoint log”. Here you can see your user Point Log Detail. If you want to see Coupon Detail of any customer click on “View Coupon Detail”. Here you can see your user Coupon Detail. Through this setting, you can notify your users about their points via email. You can easily customize that subject and description of the email according to necessity. 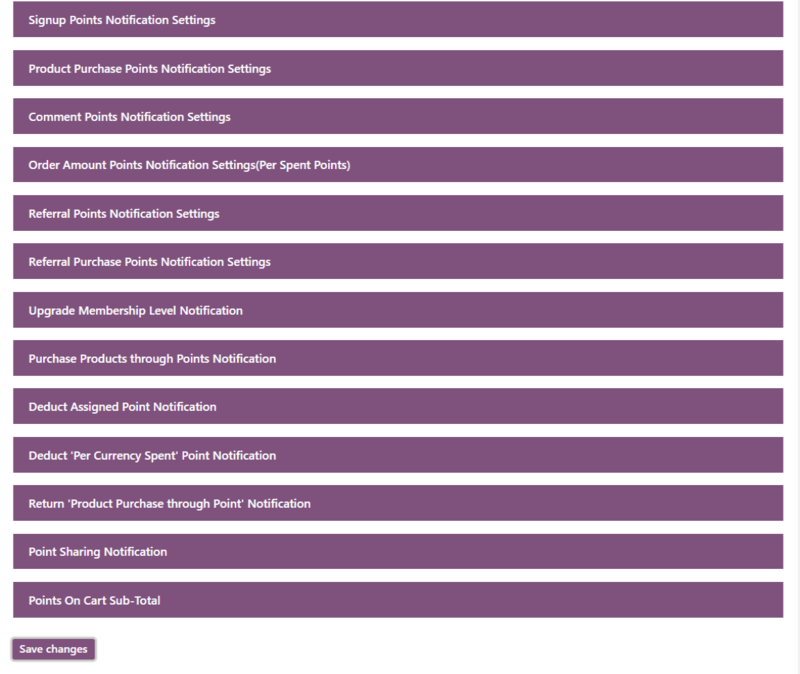 you can notify your users via multiple notifications like Total Points, Signup Points, Product Purchase points, Referral Points, Comment Points, Product Purchase Points, Referral Points, Referral Purchase Point, Upgrade Membership Level, Purchase Products through Points, Deduct Assigned Point, Deduct ‘Per Currency Spent’ Point, Return ‘Product Purchase through Point’, Point Sharing, Points On Cart Sub-Total. 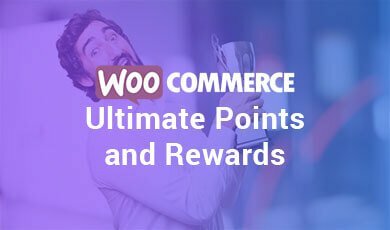 Woocommerce Ultimate Points and Rewards plugin allow you to give the membership of your customers. Membership Setting allows your customers to get the membership level through the required points and keeping the discount on the selected categories or products fulfilled by that level. 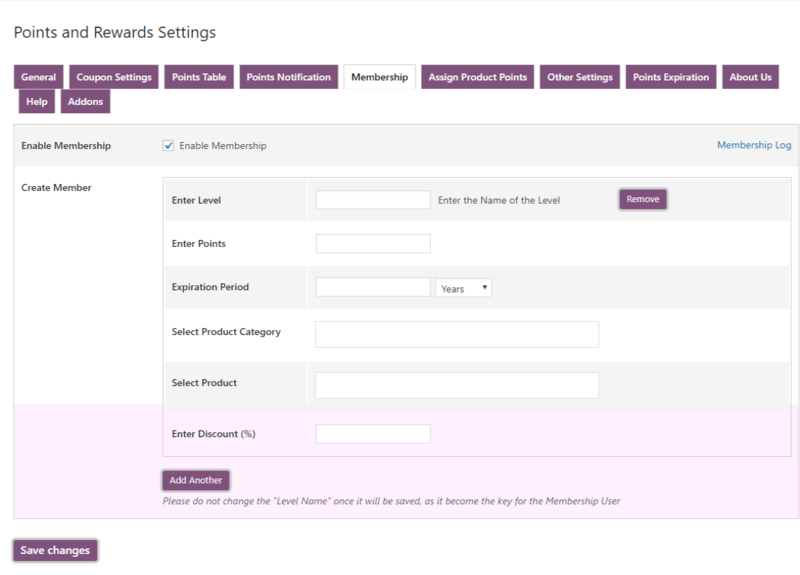 1- Tick the checkbox to Enable Membership setting for your customers and creates levels by click on “Create Member”. 2- fill the required field of the level like Level Name, Points for reach that level, Expiration Period of the current level, Select Product Category for the discount, Select Product for the discount, Enter Discount (%) amount. 3- After filling out all fields click on save changes. The level of membership will display on the user end. 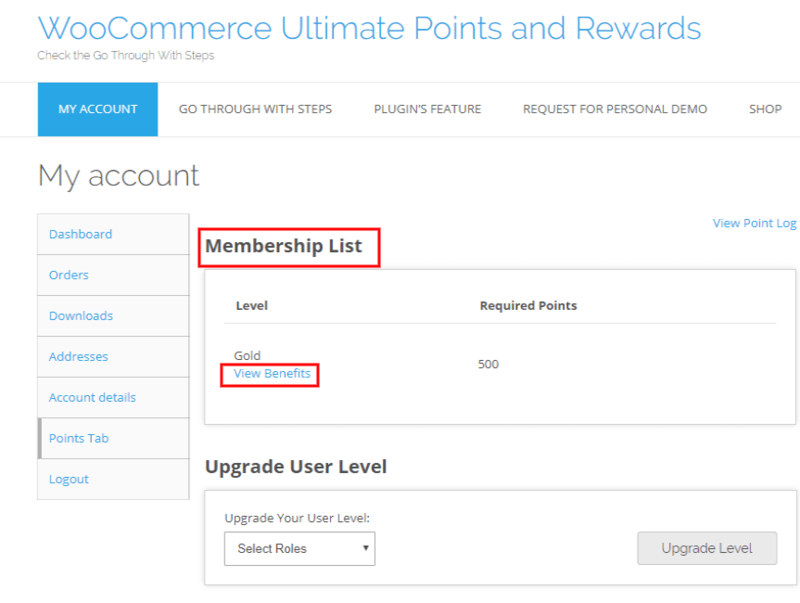 Here your customers can see Membership List on the Account Page -> Points Tab. View the benefits of that level. 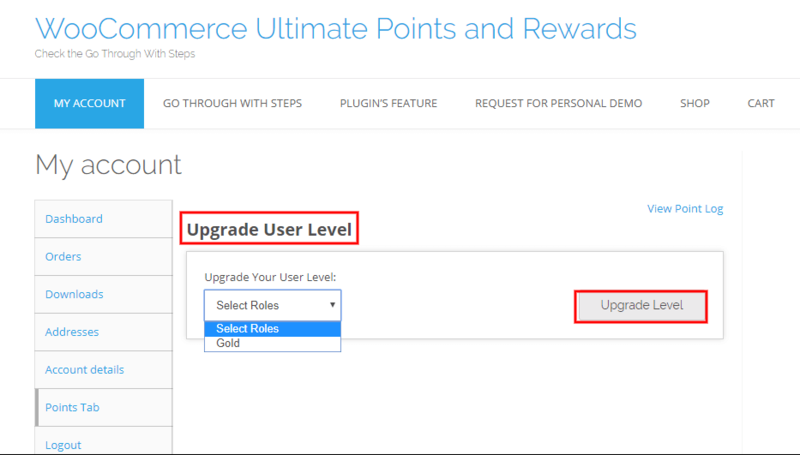 From this setting, your user can select the level to upgrade your membership. After click on the “Upgraded level”, their membership is successfully upgraded. Now they can see the discount on the single page of the selected product. Here they can see the discount. 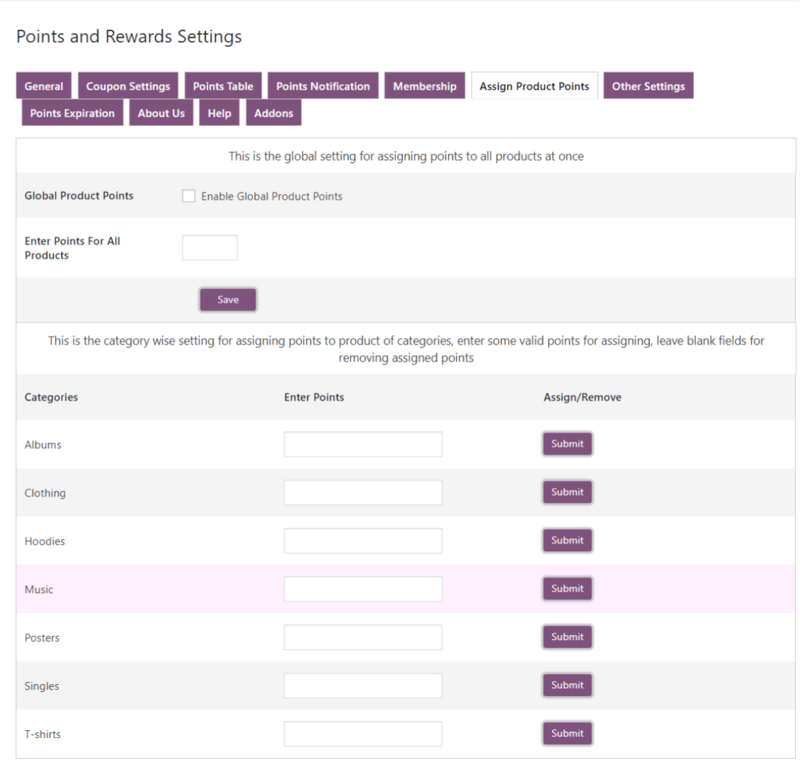 This setting allows you to assign points on the products in three ways. Through this setting, you can assign the equal points on each product at once by the global setting. 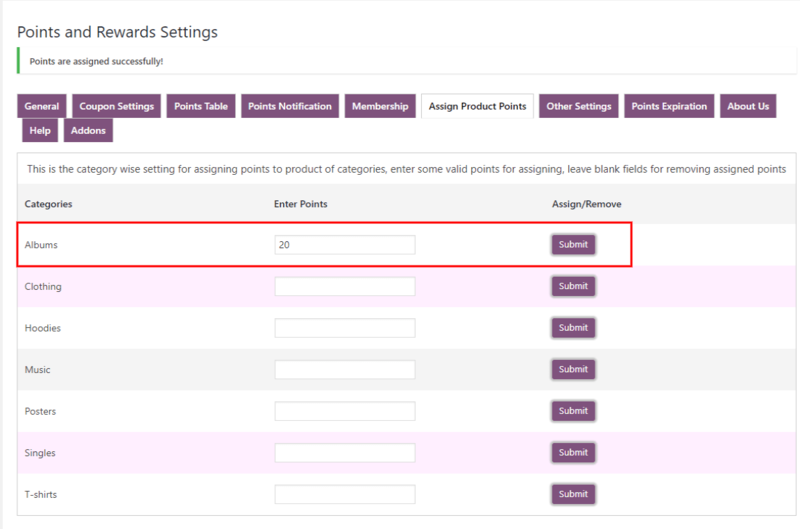 Enable this setting if you want to assign the same points on all the products and enter the points which you want to assign for all products. Your customer can see the assigned points on the single page of the product. This is the category wise setting for assigning the points to the product. Enter some valid points for assigning or leave blank fields for removing assigned points and click on “submit” button. Your customer can see those assigned points on the single page of the product. This setting for assigning points per product wise. Go to the “products” and click on the edit page of the selected product. 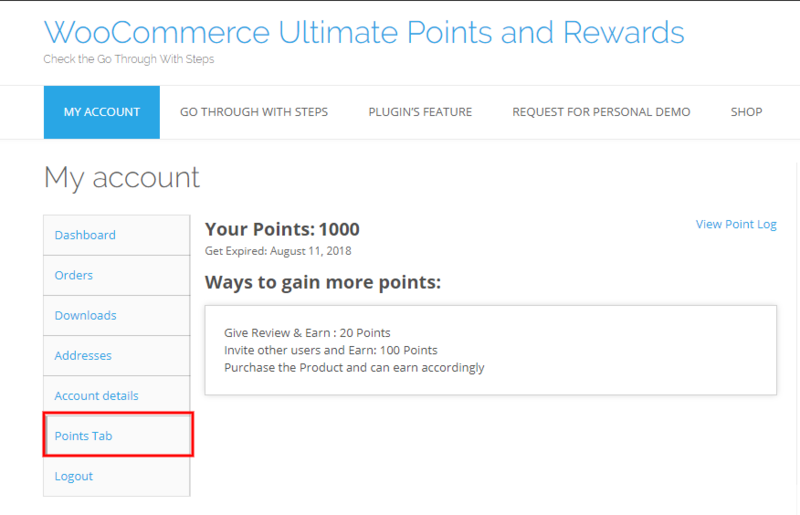 Click on “Points and Reward” setting. Enable the setting and enter some valid number for assigning points. Go to the “General Setting” tab scroll down to that setting. 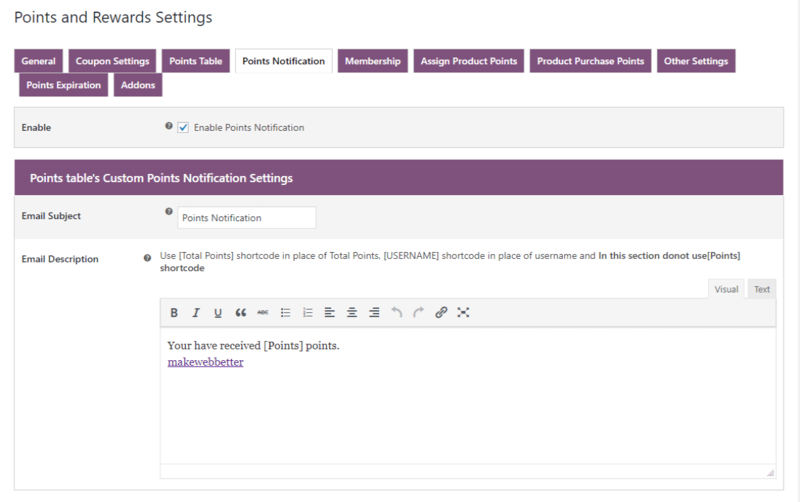 Assigned Product Points Text: Enter the notification text which you want to display on those products who have assigned with some points. 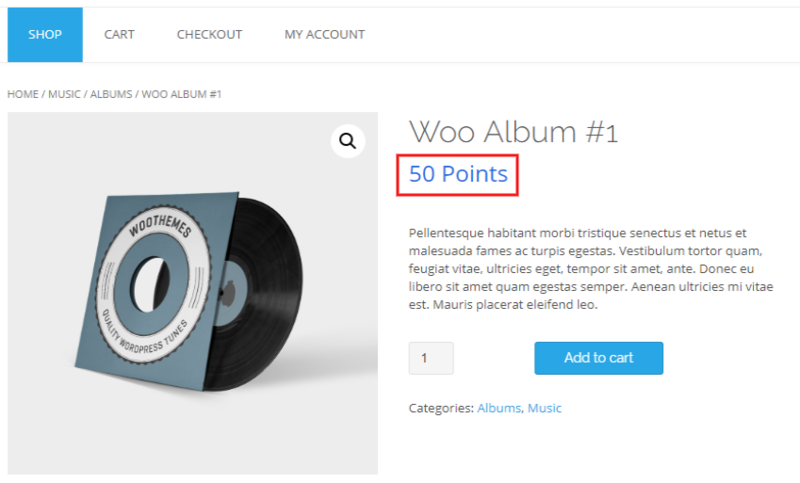 Only Product Assigned Points: Customer can get the points only for the product assigned points. Only Per Currency Spent Points: Customer can get the points only for per currency spent points. Both: Customer can get the points for both ways “per currency spent points” and “product assigned points”. 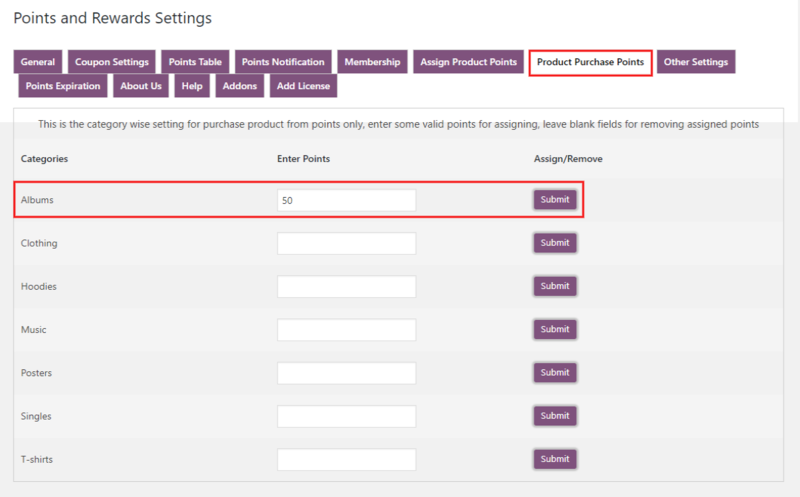 Through Product Purchase Points setting, admin can buy products only by the points. Assign Points to the particular category and click on the submit button. Here you can see that your customer can purchase that particular product only by the points. [MYCURRENTUSERLEVEL]: This shortcode use for displaying current Membership Level of Users. For example, If you want to show the current Membership Level for the customers on the shop page. 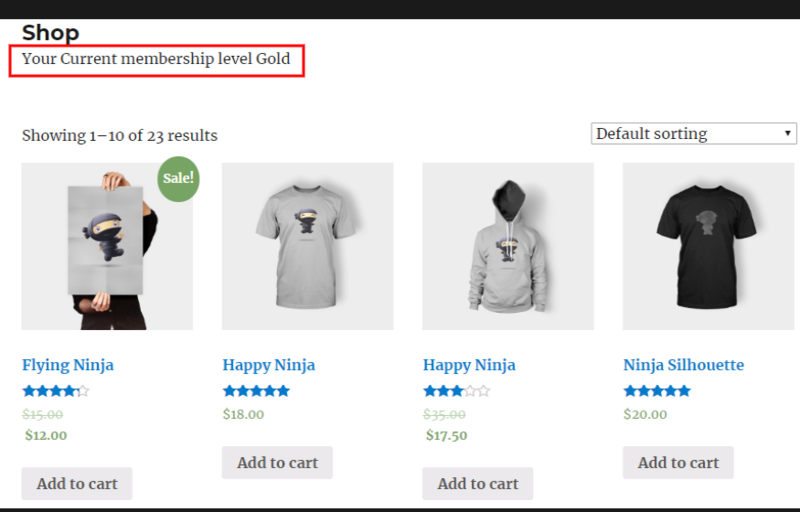 simple Go to the “Shop page” paste the Shortcode of Membership Level and click on the update button. The current Membership Level of the customer will get displayed along with the text. Enter text for Current Points: Entered text will get displayed along with [MYCURRENTPOINT] shortcode. [MYCURRENTPOINT]: This shortcode use for displaying current Points of Users. 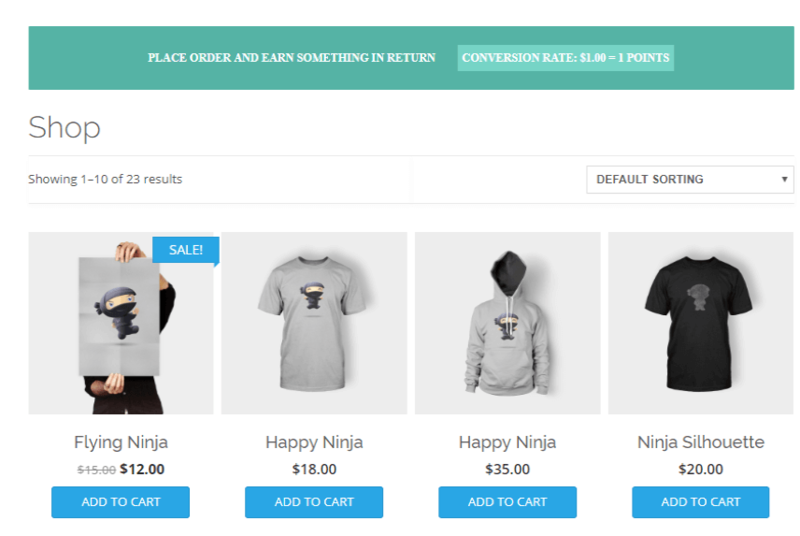 For example, If you want to show the customer’s current points on the shop page. 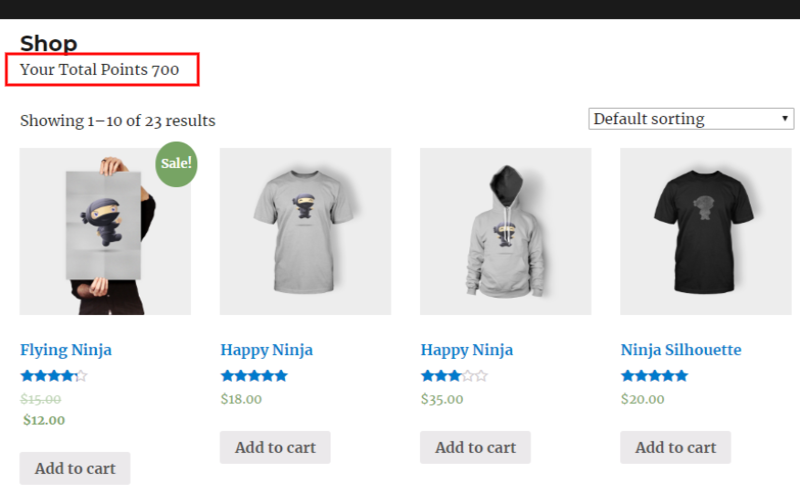 simple Go to the “Shop page” paste the Shortcode of current points and click on the update button. The current points of the customer will display with the text. Enter text for Current User Level: Entered text will get displayed along with [MYCURRENTUSERLEVEL] shortcode. 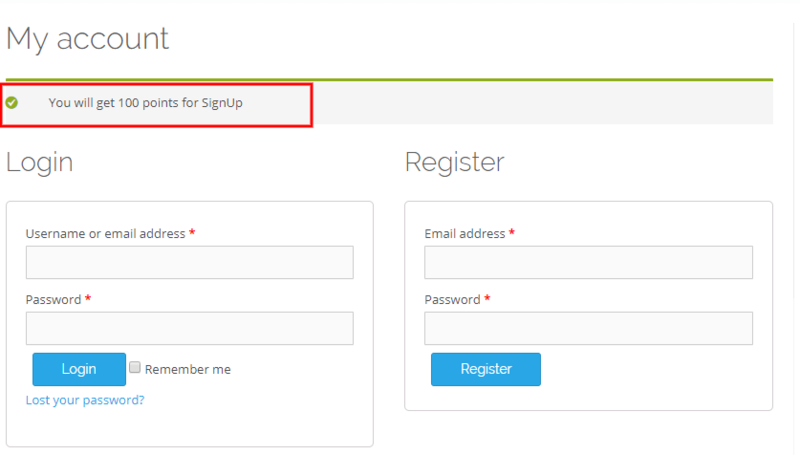 [SIGNUPNOTIFICATION]: This shortcode use for displaying signup notification anyplace on site. 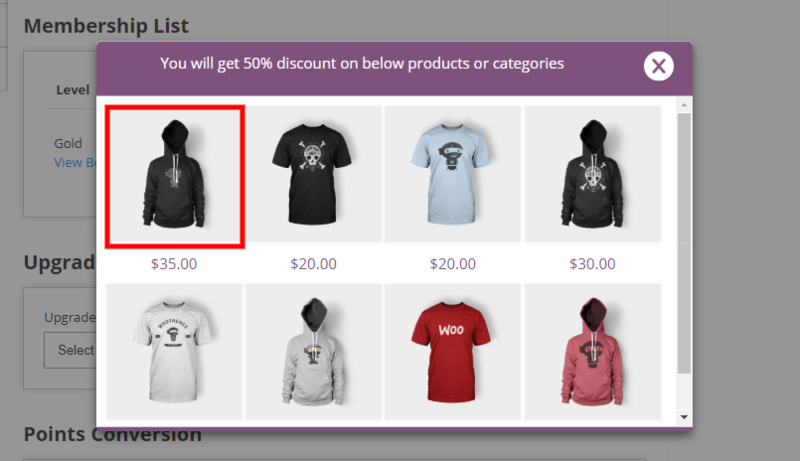 For example, If you want to show the signup notification on the shop page. simple Go to the “Shop page” paste the Shortcode of sign up notification and the most important thing is that the signup point feature must be enabled from the “General Setting”. Enable this setting if you want to allow your customers to share some points from his/her account of any other user. After enabling the setting your customer can share your points to other users by simply clicking on “GO”. Static Referral Link: Enable the setting to make your referral link permanent. The Expiry date of Referral Link: Set the valid number of days after that the system will not able to remember the referred user anymore. 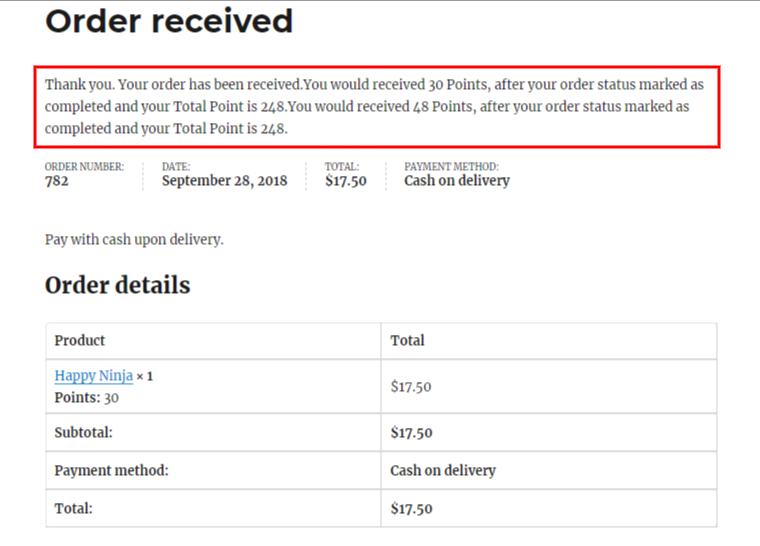 These shortcodes for providing an appropriate message for your customers for their Total Points when they gain or spend points on the checkout page. Through “Enable Apply Points During Checkout” setting, admin can allow your customers to apply points on the checkout page. 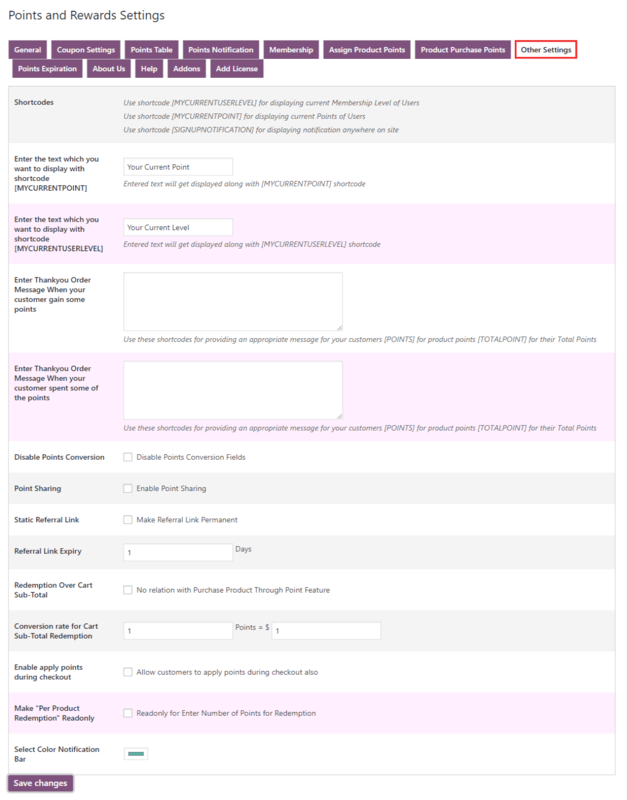 Here you can see apply points options on the checkout page. Redemption Over Cart Sub-Total: Enable this setting if you want to allow your customer to redeem their earn points into cart subtotal. There would be no relation for purchase through points feature. The conversion rate for Cart Sub-Total Redemption: Enter redeem points for cart subtotal. Make “Per Product Redemption” Read-only: Enable this setting if you want to make the redemption box used readonly for your customers. Here you can select color for notification bar. 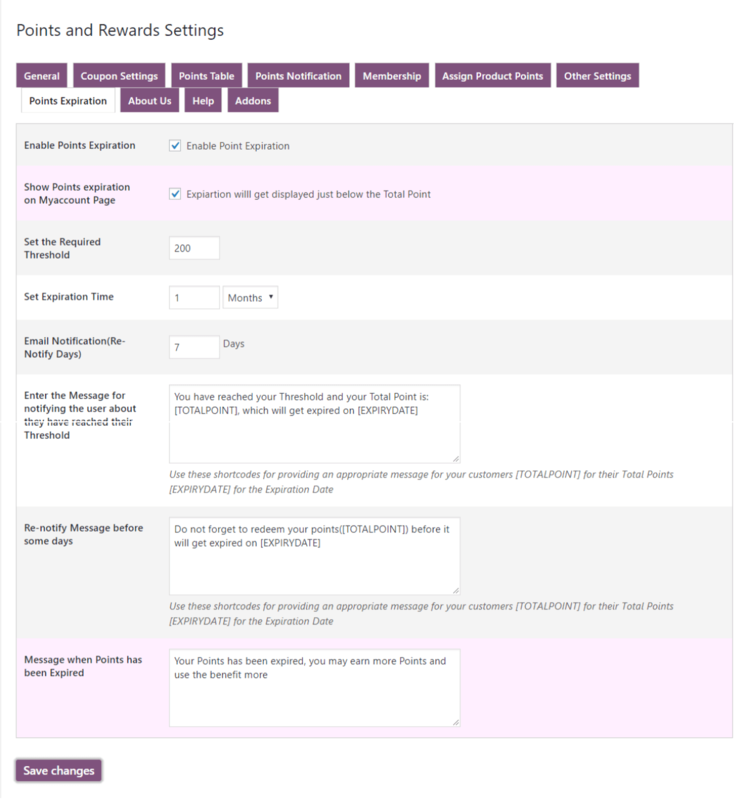 In this section, you can set the Expiration Period of the customer’s points and send the Notification Mail as a reminder of the expiration of points. Enable Points Expiration: Enable this checkbox if you want to set the expiration time period of rewarded points for your customers. 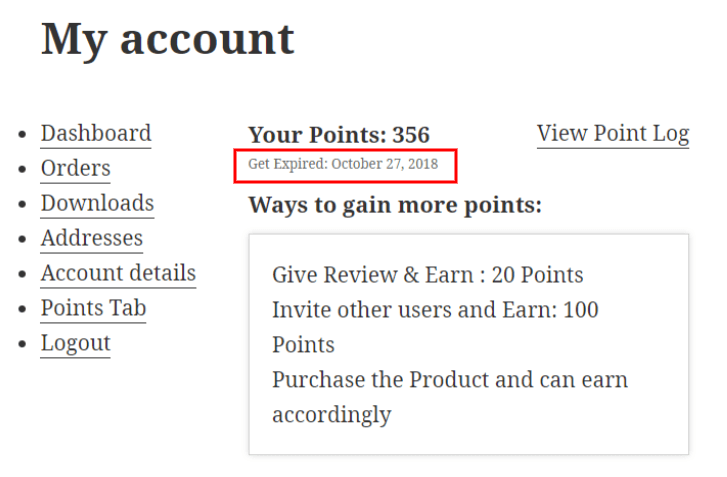 Show Points expiration on My Account Page: Enable this setting if you want to show the expiration time period of points on my account page. Set the Required Threshold: Set the threshold for rewarded point expiration, the expiration period will be calculated when the threshold will be reached. Set Expiration Time: Set the maximum time limit for points expiration. After this time limit points need to get expire. It will be calculated after the above threshold time. Email Notification(Re-Notify Days): Set the number of days before the mail will get sent out for the re-notify the customer for points expiration. Enter the Message for notifying the user about they have reached their Threshold: Use these shortcodes for providing the first notification to the customer, that they have reached the threshold now they should redeem their point before it will get expired. Re-notify Message before some days: Use these shortcodes for providing the re-notification their the customer that they have left some days more for the expiration of points. Message when Points has been Expired: Enter the message to notifying your customer that their points have been expired.